I love being organized and even more then that I like having things to organize my stuff. Well today I am going to tell you about this really nice product from ToiletTree Products they make all kinds of bath items, accessories, facial items and so much more. Today what I am going to tell you about is their Single Wall Mount Dispenser they come in two colors brushed aluminum or white. They range from $17.95 to $49.95 depending on how many you get. ToiletTree Products wall mount dispensers are the perfect way to eliminate clutter in your shower. You can now elegantly store soap, shampoo and conditioner in the bathroom. Our wide opening top makes refills fast, easy and spill free. Our clear chamber allows you to see when it's time to refill. 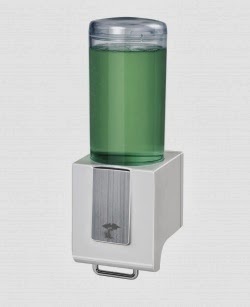 The dispenser is made using long lasting, quality materials that will not rust or discolor over time. ALL ToiletTree Products come with a 100% customer satisfaction guarantee. this is awesome,it looks much bigger than the ones i seen at the store..